Erica Fernandes is seen playing the role of Prerna in Kasautii Zindagii Kay. 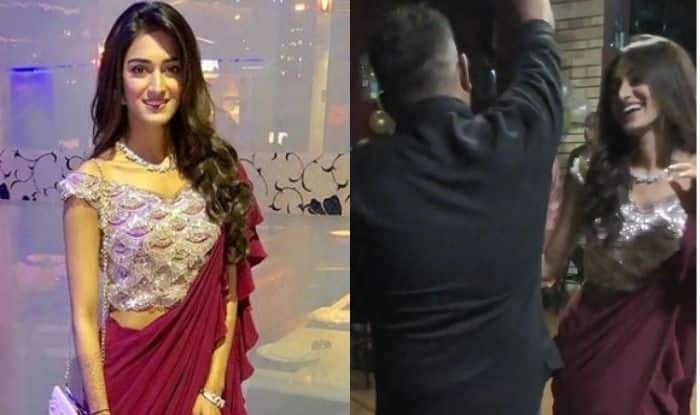 Television actress Erica Fernandes, who is receiving love for playing the role of Prerna in Ekta Kapoor’s popular show Kasautii Zindagii Kay, is quite active on social media. She enjoys a huge fan following. Recently, the lady shared a throwback video from an engagement bash in which she can be seen doing jive with her friend. Dressed in red ruffled saree with silver blouse, Erica looked beautiful. The video proves that she is a fantastic dancer. Well, we have seen her as talkative and caring Prerna on the small screen and thus, this latest post is a welcoming change for all her fans. Erica is a fun loving person who is often seen teasing her co-stars. In fact, she shares a great bond with Parth Samthaan who plays the role of Anurag. Both the stars are being praised for their performances. A new promo of the show released recently which showcased the face-off between Prerna and Komolika. Hina Khan plays the role of Komolika in the show. She received positive response for her performance and the audience fell in love with her swag. However, she disappeared after a few episodes because of her Bollywood debut. In the current slot, Prerna has expressed her feelings for Anurag in front of her sister. It will be interesting to see if she manages to confess her love to him. Kasautii Zindagii Kay is the revamped version of the old show but story remains the same. It revolves around two people who are head over heels in love with each other but faith doesn’t let them be together. On a related note, before working in daily soaps, Erica participated in beauty pageants. Her first TV show was Kuch Rang Pyar Ke Aise Bhi which also featured Shaheer Sheikh.